Located between Issigeac and Villereal, our family home welcomes 15 people on a private park of 3 ha with private pool and tennis. Total calm in the charm of the countryside, birdsong and green trees. 3 ha of tranquility on a fully fenced plot and the owners are not on site. 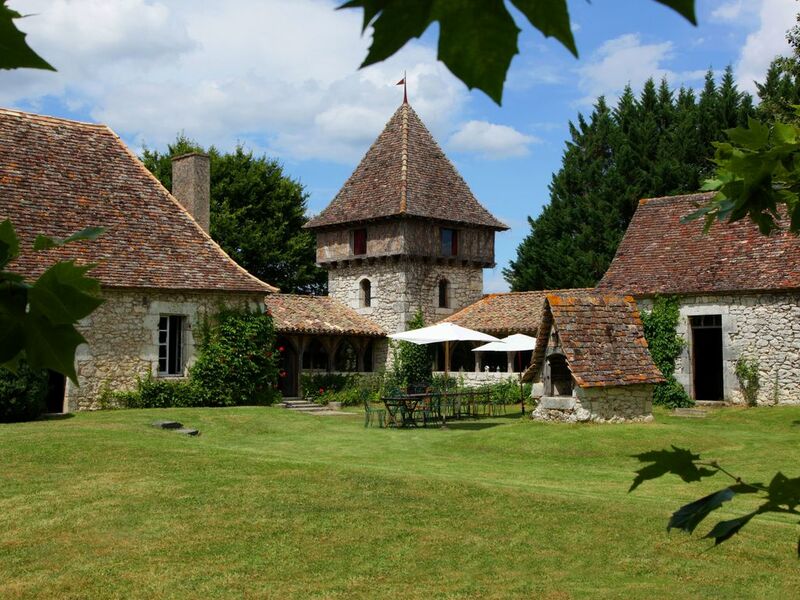 A traditional French property with all the home comforts you could wish for. The location, layout of the property and ameneties were excellent you would never have known 15 people were present. Charlotte was great and very helpful, speaking French and English. I would thoroughly recommend this property. We visited the house in the middle of June together with our children and partners all in their early thirties. The house is quirky but lovely and was a project taken on by the current owner's, Charlotte's, Dad who joined two old buildings constructing the tower and cloister-like passageways in the process. Charlotte has updated it with the result that it is a very comfortable and spacious place to stay. It is quite cut off, so cars are necessary, but it is very self-contained. The shaded tennis court and big pool (although unheated it was at 27 deg C) were particular hits with our party. The nearest supermarkets and petrol were at Villereal. The area is lovely. We enjoyed the bastide towns and villages with Montpazier and Domme being particular favourites. We organised some wine tasting at a local chateau. One of the highlights of the holiday was canoeing on the Dordogne which was just great. All in all a lovely break. Thank you Charlotte for being such a good host. We had a wonderful time in this lovely house. The pool, tennis court and gardens were enjoyed by all the 8 children. The adults enjoyed relaxing occasionally! We canoed on the Dordogne, visited local villages, chateau and a music festival. We ate well and enjoyed the local restaurants in small groups. Cette maison est parfaite pour vivre en famille nombreuse (de l'arrière grand-mère au petits enfants), tout en gardant chacun son intimité. Telle une fée qui distribue le bonheur, elle offre ce que l'on recherche en vacances, tantôt des parties endiablées de tennis, de foot, de pétanque..., tantôt lecture et farniente au bord de la piscine ou seul, sous un arbre, dans un hamac! Les soirées se prolongent autour d'une grande table familiale au gré des spécialités culinaires concoctées avec les produits du terroir. Moment rare, être déconnecté totalement d'une vie actuelle stressante, au sens propre, pas de Wifi, et figuré. Merci pour ce privilège. This is a wonderful house for a big family group. It is every bit as beautiful as it looks in the photos, with lots of space for activities either separate or together depending on your needs. The pool is great, and its good to have a deep end and a diving board. Small kids would need watching. There are endless opportunities for day trips to surrounding Bastilles, and there is canoeing on the Dordogne about 45 mins away. Charlotte was a really helpful host and quickly sorted out any problems. Highly recommended. Nous sommes un groupe de 5 couples (entre 73 et 85 ans) habitués aux séjours en location. L’un d’entre nous a une mobilité réduite. - toutes les pièces sont d'un accès aisé. - la cuisine est fonctionnelle avec tous les accessoires nécessaires. - la literie est confortable. - le grand parc est agréable. Nous n'avons pas eu le temps d’en visiter tous ses recoins. - la propriétaire est aimable et au service de ses hôtes à tout moment. Nous avons passé un très agréable séjour au domaine de la fée verte.